You are here: Home>History of Welwyn Garden City>Where Do You Think We Played?>Where do You Think We Played? 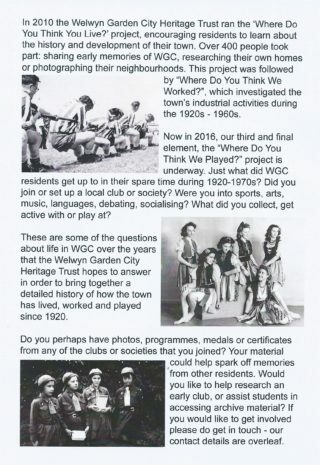 Researching what Welwyn Garden City did for leisure. Welwyn Garden City Heritage Trust produced this leaflet regarding the Where Do You Think We Played? project. This page was added on 14/03/2016. I have some memories of the 2nd Scouts in the hut in the King George V playing fields and the Boys brigade in the Free church opposite Sainsburys, but my father could help you far more. 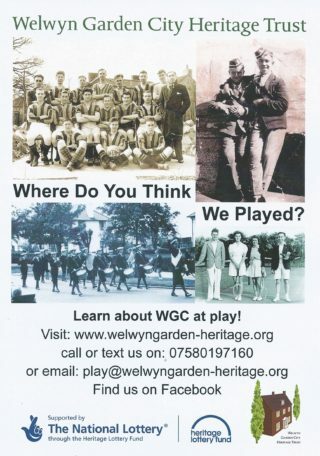 He was born in 1935 in WGC, but now lives in Welwyn village. He was involved in Peartree boys club and I think he has some football medals from playing with the boys club team.